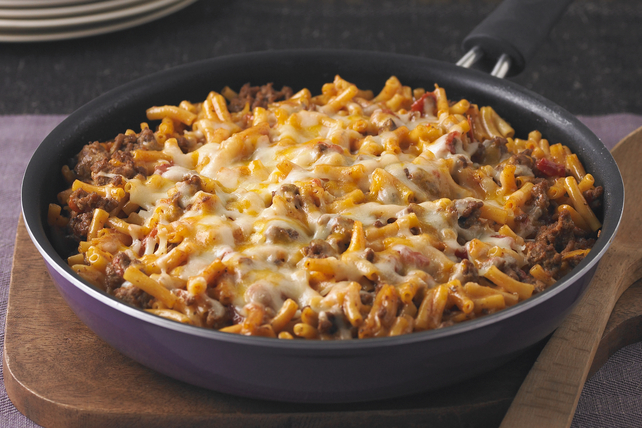 If you've got a pound of ground beef and a package of KRAFT DINNER Macaroni and Cheese, you've got a head start on our Cheesy Macaroni-Beef Skillet recipe. Add some diced tomatoes and shredded cheese to the mix and you're on your way to a beefy mac and cheese entrée. Stir in tomatoes and water; cover. Bring to boil. Stir in Kraft Dinner; simmer, covered, on medium-low heat 10 min., stirring occasionally. Top with shredded cheese. Remove from heat. Let stand, covered, 5 min. or until shredded cheese is melted. Serve with a tossed green salad and your favourite Kraft Dressing. Prepare using 1 can (19 fl oz/540 mL) chili-style seasoned diced tomatoes and shredded Cracker Barrel Cheddar Cheese.